Drink When Thirsty debunks the many myths about hydration and dehydration like “If you are thirsty, it’s already too late” and “If your urine is yellow, you are dehydrated.” This article suggests that Drink When Thirsty is the best and healthiest strategy for hydration during exercise. It turns out that your body’s natural, thirst mechanism (700 million years old) works well to keep you hydrated and healthy during exercise. In fact, the amount of water your body requires is probably far less than what the Sports Drink and Bottled Water companies have been telling us. Best Hydration and Purification System – It’s NOT Complicated! The simple, inexpensive Hydration and Purification System that Alison and use is shown above. When “drinking to thirst,” it has kept us well hydrated — even between distant water sources in the desert. 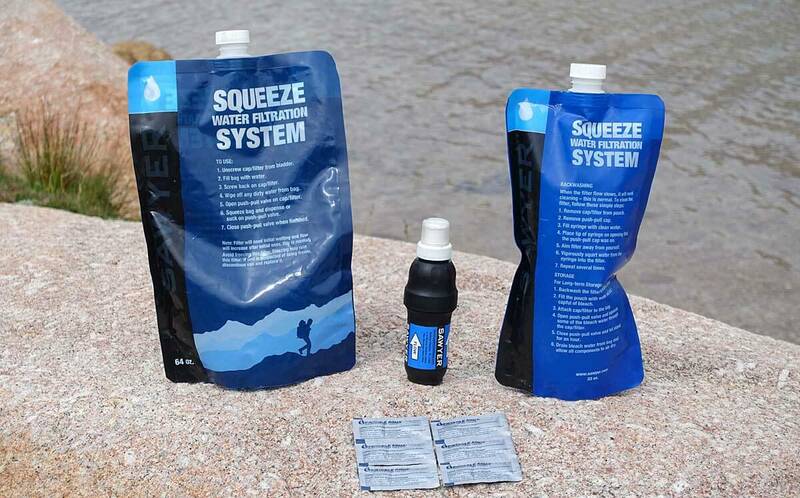 Sawyer Squeeze Filter: We can drink immediately at water sources. This means both quick, effective hydration and less water to carry when we hike. Water Treatment Tablets: For fast, efficent water purification in camp. We can treat 3 or more liters of water in less than a minute. And it’s ready to drink 20-30 minutes later. All the experts in sports hydration I talked with adamantly agreed that Drink When Thirsty is the best and healthiest strategy for hydration during exercise*. Excessive drinking when you are not thirsty increases the risk of hyponatremia, arguably a greater risk than dehydration. *Dr. Tamara Hew-Butler says the natural thirst mechanism has been working in animals and keeping them well-hydrated for at least 700 million years. See more from Dr. Hew on how the human thirst mechanism works. So why have we been told to drink, drink, drink? Why do we continue to hear sayings like, “hydrate or die,” “if you are thirsty, it’s already too late,” and stating that “your athletic performance will drop if you don’t drink enough“? And that this “lack of evidence” is in part due to the close financial and other affiliations between the sports drink companies and the scientists/researchers and supporting institutions that produce the research to support this view. Cohen’s article gives examples of studies supporting the sport drink companies claims, that when reviewed by an independent panel of experts, are not deemed robust enough to support those claims. ‘Disease mongering is a well documented phenomenon in healthcare6 and Noakes suggests that industry has followed a similar pattern with dehydration and exercise. Again, Drink When Thirsty is the best strategy. Dr. Kristin Stuempfle says that studies7 show that the human body can only process a maximum of 0.8 liters (27 oz) to 1 liter (34 oz) of water at rest. That is not what your body needs—just the maximum amount of water it can process if needed—an important distinction. That maximum amount of water processed will go down during exercise. According to Dr. Stuempfle our body’s natural response to exercise is to shunt blood from the kidneys and the GI (stomach and intestines) and put it toward motor (leg) muscles, heart, and skin (cooling). In addition, during exercise the body secrets a natural antidiuretic hormone (ADH) to slow urine output. All these combine to reduce your body’s ability to process water. So if you drink more water than you need during exercise (i.e. not drinking to thirst) then your body is receiving more fluids but has less capacity to handle them. Thus the risk of overhydration, and possibly hyponatremia. In cooler environments where water is plentiful you may not need to carry any water with you. Drink from the source, and you will likely not be thirsty when you reach your next water source. Dr Hoffman says that: “Trying to keep urine clear during exercise will cause over hydration.” There was complete agreement among all the researchers on this point. And from Cohen’s article5: “The science of dehydration has led to another widely held belief that is not based on robust evidence—that the colour of urine is a good guide to hydration levels.” And also from Cohen’s article5: “There is a lack evidence for the widely recommended practice of assessing hydration status by looking at the colour of urine,” it suggests. All the researchers I spoke with agreed that cramping is complex, not well understood and likely has multiple causes. They also agree that dehydration and electrolyte depletion are not likely the main causes. Dr. Hoffman not only noted that cramping appears to be neuromuscular, but that dehydration or electrolyte depletion does not cause cramping. Dr. Hoffman said this finding has been known for a number of years. In fact, cramping has more to do with neuromuscular nerve misfiring—nerves sending a false signal to muscles to contract and stay contracted, as indicated in research10 by Martin P Schwellnus, UCT/MRC, Research Unit for Exercise, Science and Sports Medicine, Department of Human Biology, Faculty of Health Sciences, University of Cape Town, South Africa. How much water should I Drink/Carry on a hike? This is the big challenge for backpackers, day-hikers or others that need to carry enough water between distant sources. Unlike Dr. Hoffman’s “There is no real danger of dehydration when people have access to water,” there is a possibility that if we don’t carry enough water between distant sources that we could run out of water and potentially become dehydrated. On the other hand, if we are hiking a long distance between water sources and and decide to carry 5 liters of water we are carrying an additional 11 pounds. This too has serious downsides. How do you estimate the “right” amount of water to carry between distant sources? On test day-hikes (or a weekend backpacking trip), Drink When Thirsty and record the amount of water your drink per hour. Try to do this close to the same level of exertion, and temperature and humidity that you will expect on your backpacking trips (or long day hikes). Use this consumption rate per hour as a starting point for estimating the amount of water you’ll need to carry between distant sources in the field for your longer and more serious trips. It is best to be conservative (carry a bit more water) until you have tested out and fine tuned your personal water consumption rate over at lest a few longer trips in the field. Obviously if it is hotter, more humid, you are working harder, or your pack is heavier, you may need more water per hour. But, if it is cooler, less humid, or you are not working as hard, you may need less water per hour. On a personal note, when following Drink When Thirsty I frequently do not carry any water with me in the field (Sierras, Appalachian Trail, etc.). When I drink (using aSawyer Squeeze Filter so I can drink directly at the source), I find that I am unlikely to be thirsty until I reach the next water source. My wife seems to run a bit thirster, and in addition to drinking at water sources, she usually carries somewhere between ½ to ¾ of a liter between sources. Although I rarely carry water with me, the desert is the exception. This picture is from a drought year in the Southern Utah desert. So an unusually dry time in an already hot and dry place. I have collected a lot of water: for dinner that evening, breakfast the next morning & to carry during the day to our next reliable water source. The only place we carry large amounts of water between sources is in the Desert Southwest, like Canyoneering in Utah. But even then, following Drink When Thirsty, we carry less water than the “recommended” amounts in guide books and other “authoritative” sources. We pull long days in the desert and feel healthy and fine. But we have years of field experience and comfortably know our personal water needs in the desert. Brain sensing electrolyte levels11: Your brain has real-time osmosensors that monitor sodium concentrations (more specifically, the amount of osmoles, for which sodium makes up the greatest amount) circulating in the blood. When sodium levels start to rise above normal, your body has a two stage response. The first response, is to slow urine output and therefore water loss (this occurs before thirst is triggered). If sodium levels continue to rise, your thirst mechanism kicks in and you become thirsty. It is important to note that you are NOT dehydrated at this point. All this happens before dehydration becomes an issue. This is your body’s normal mechanism to keep you from getting dehydrated. Dr. Hoffman and Dr. Hew-Butler both point out that as long as folks have access to water, their thirst will cause them to drink and not become dehydrated. Your heart (actually the main valves) senses blood volume (water): Your heart valves have barorreceptors that can detect a reduction in blood volume (water in the body). This also has a two stage response just the same as the brain’s osmosensor responses. Stage 1 happens at an 8-10% blood volume depletion and triggers an anti-diuretic hormone release which slows urine output and therefore water loss. You are not thirsty at this point. If blood volume continues to decrease, your thirst mechanism kicks and you get thirsty. Again note: that you are NOT dehydrated at this point. All this happens before dehydration become an issue. This is your body’s normal mechanism to keep you from getting dehydrated. Drink When Thirsty, it’s been keeping hominoids well hydrated for millions of years. 6 Moynihan R, Heath I, Henry D. Selling sickness: the pharmaceutical industry and disease mongering. BMJ 2002;324:886. Great article Alan! Thank you for sharing. I found it very helpful. One thing that might be good to highlight to your readers is that when using the water purification tablets or drops (chlorine dioxide), it takes 4 hrs to kill cryptosporidium. Everything else is killed in 30 mins. That information is from the Aquamira website. I don’t have my drops or tablets handy right now so I can’t check the direction on the labels. OK. I’ve never looked into what was in the water sources where I was going. I just treated for the worst case. But I may consider researching that in the future. It would be nice not to wait 4 hrs. How easy or hard has it been for you to uncover water issues where you are going? I typically use a Sawyer filter mini with Sawyer and Platypus pouches. The pouches fill easily in running streams however, I find them difficult to fill in a lake. Do you have suggestions for harvesting water from lakes? Not carrying a lot of water was one of the hardest changes I’ve made in revamping my backpacking routine but you’re right! Thank you for all of your information. I’ve gone to your site more than any others for your well thought out and solid advice. Thank you for sharing your expertise and your passion for the wilderness! I keep returning to this site because it is based on one who walks the talk after researching the talk. Another nicely researched and supported piece. Much appreciated. I’ve read that giardia in various concentrations can be found everyone, pristine lakes, streams, maybe there’s a high amount to cause illness in everyone, a low amount, no one? In the 70s filtering was unheard of, all of a sudden people had to filter everything everywhere, where did all these bugs come from. Patrick, sorry for the delayed response. Your comment came in while I was in the midst of site upgrades. What about the possible affects of hiking at high altitude? A symptom of altitude sickness can be loss of appetite. Can this also affect the thirst mechanism? You are always encouraged to drink plenty of fluids at high altitude…. My question is can mild (and possibly not recognized) altitude sickness result in dehydration because you don’t feel like eating or drinking. As a result you may want to track how much you drink to make sure you are staying hydrated and possibly drink more water (not excessively) than you would by just relying on the thirst mechanism. VERY interesting article! Thank you for all your research and clinical citations. I think you’re certainly on the right track. The difficult variable for which to control in the Drink When Thirsty theory, the x-factor so to say, is when individuals FEEL thirsty. Regardless of the science, everyone is different. In some sense, it’s like instructing people to layer up when cold. Everyone has a different tolerance for being cold and that dictates what people carry in their packs and certainly impacts their pack weight. You touch on this with the “personal water needs” disclaimer, but I think it’s an important distinction. Generally speaking, I think you’re absolutely right that people in the outdoors carry more water than they need…but they generally carry more food and gear than they need, too. There’s a “just in case” element that responsible hikers and backpackers need to build into their pack system to stay safe on the trail. The trick for those interested in reducing pack weight would seem to be to add water to their list of gear to put on the chopping block. If I’m solo backpacking and only carrying the necessary equipment to drink at the next water source when I’m thirsty, and I have an accident on the trail in which I fall, twist my ankle, or otherwise get injured in one of those freak accidents that can occur in the backcountry, I might not be able to make it to the next water source! At that point, I could be in some trouble if I am not carrying an on-board water supply. Remember, too, water isn’t just for consumption, it can be a necessary resource in first aid/wound treatment. Water for first aid must be considered when determining how much water everyone needs to carry. My own personal estimate is a small, 500mml/16 oz bottle that is reserved for emergency use only; emergency consumption and emergency wound treatment. All in all, I think you are right; people carry too much water with them. The trick is to reduce the volume of water in your kit to keep your outdoor experience enjoyable, safe, and self-sustainable. Excellent work! See you on the trail. You have to be careful with the following statement: “On a personal note, when following Drink When Thirsty I frequently do not carry any water with me in the field (Sierras, Appalachian Trail, etc. )” – This could influence someone to make a dangerous decision. You see, before the fires in the lower AT this Fall in NC, there was a drought. Many of the sources on the guide were completely dry, but this information was not out yet on the web. I still made the right decision to carry my almost 3 Liters which paid off when passing the signs that had a piece of paper attached reading “No water” or “no water from here until XYZ” on my 20 – 24 mile days during a 3 day / 2 night hike. Very informative post. Thank you for your research and references for this article. Interesting points on marketing around thirst to create more demand even if we actually do not need it. As you said on a prior response – “Thirst is a trigger so we don’t get dehydrated, not a indication that we are dehydrated” – in other words, listen to your body wisely. Soldiers from humid southern states could handle the humid conditions in the jungle better because they had maintained their full number of sweat glands they were born with. Whereas, soldiers from the far west IE drier areas were unable to cool themselves due to “dis-use” atrophy of a high percentage of the number of sweat glands that they had at birth. As I recall this opinion was based on a “sweat gland count,” which we duplicated with iodine & corn starch under a Saran Wrap cover to show presence of moisture. Dry stays red due to lacking moisture and sweat triggered blue showing starch and iodine interaction. Not sure of the militarys method for counting. The effiency of cooling by sweating being a variable for consideration in your discussion of hydration management if what I am trying to raise. Hoping someone reading this will find a reference to the US Army’s research. Nice post! I have always thought I drank too much water. I found your post to be very informative. Also, you many want to trim your last sentence (“Drink When Thirsty, it’s been keeping humans well hydrated for millions of years”) from millions of years to 200,000 years. I don’t think humans are that old yet. I have amended it to “hominoids.” Oldest human genus (Homo) remains date back almost 2.8 million years. And “Lucy,” genus Australopithecus (non-Homo genus) dates back to 3.2 million years. Pretty nice post. I just came across your site and wanted to saythat I’ve really liked reading your blog posts. In any caseI’ll be subscribing to your feed and I hope you post again soon! gccsteve / I just came across this the other day after starting a bathroom complete tear out/remodel.I'd just like to say what a very well written, informative and humorous article this is.Well done and I hope you are finished with your project. The suggestions you provided here are extremely useful. It had been such a fun surprise to see that awaiting me immediately i woke up today. They are often to the point and simple to learn. Warm regards for the clever ideas you’ve shared in this article. I usually am walking fast enough to sweat even when wearing only a baselayer in a Welsh winter. Will sweat output (not sure how this could be measured?) not affect need to drink regularly? Very interesting and informative! There is definetely many sayings and rumors that are not true, or understood. Another very interesting and informative post. Common sense prevails! I’ve always thought the “if you’re thirsty, it’s too late” maxim made little sense. I’ll admit to skimming this hugely informative post, so I apologise if my two anecdotes add nothing. The post is in my reading list, so I will get back to it. Firstly, the drink, drink, drink message is older than the sports drink boom. In 1990, in NZ, a man from Hawaii told me to drink a dozen cups of water a day. He said it was absolutely essential to drink that much to stay hydrated and to get rid of poisons. Second, cold weather in windy, desert conditions can be dangerous for those of us from damper climes. Descending the Grand Canyon in May, I felt no thirst at all. In Scotland, my skin feels wet when I sweat. This did not happen in the Grand Canyon so one warning sign was missing. Next morning, my urine was brown and I drank three pints of water and a pint of tea before my urine started to look healthy. Thank you for the post. It must have taken a lot of work to put together.